A penthouse at La Maison Residential Tower ... an ongoing Wilson Associates project in Dubai. The economic downtown of 2008 has served to create a more mature Dubai, says a seasoned interior architecture professional who has witnessed first-hand the amazing transformation of the UAE emirate over the past two decades. The economic downturn forced the closure of several of the city’s decoration studios – many traditional in style – giving way to younger, stronger companies with an aesthetic all their own, says Isabel Pintado, senior vice-president and managing director who leads the Dubai design studio of Wilson Associates, a US-based global interior architectural design firm. “So strong is this talent that events such as Downtown Design, Design Days, and Art Dubai, among others, have emerged to celebrate the local designers in the region and to bring the design community together, fostering collaboration and the exchange of ideas – key factors necessary for any industry to flourish,” Pintado tells Gulf Construction. D3 brings a hub for collaboration and interaction to the design world of Dubai, Pintado says. 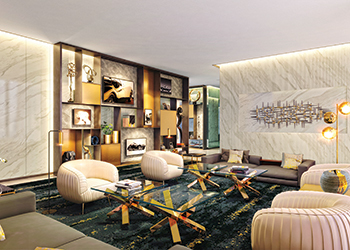 The waiting area at La Maison Residential Tower. Wilson Associates, which set up its Dubai operation three years ago to serve as a central hub for its work in the region, will be relocating its local office to the Design District shortly. Pintado says that with the influx of designers and creative minds, there has been a regional market shift toward tourism, driven by declining oil revenues. As such, Wilson Associates is thrilled about the direction Dubai is heading in terms of design, and is honoured to be part of this important change, she says. “Our firm is deeply involved in hospitality design in the region, and has actively been working in Dubai from our offices around the world for over 20 years,” she says. Pintado oversees the design direction for each project, and generates opportunities for Wilson’s global design studios. The interior architecture professional, who has witnessed Dubai’s transform over the past 20 years, has an invaluable familiarity of the region’s culture and business landscape combined with an in-depth knowledge of the industry. Over this period, the design industry has seen significant evolution, she says. Dubai Design District ... brings a “hub for collaboration and interaction” to Dubai’s design world. Wilson Associates’ Dubai office supports its other offices around the world in a range of projects, and spearheads its own work. 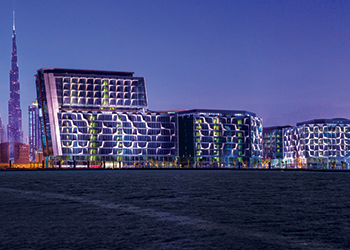 The firm has in the last eight months secured many notable projects, including the refurbishment of Marriott Doha; a new Marriott in Taghazout, Morocco; the HDS residential tower and The Address Golf Club house at Dubai Hills, both in Dubai; and The Address hotel and residences in Ras Al Khaimah, to name a few. “These are all magnificent projects and we are thrilled to be working with these clients to deliver outstanding and unique projects,” says Pintado. Among the practice’s ongoing projects is La Maison Residential Tower, located in the heart of Dubai’s dynamic Business Bay, which is expected to set a new standards for luxury living in the city. Standing 105 storeys tall, the tower will reach skyward from a podium that will house amenities such as a health club with an outdoor swimming pool and spa, library, and a children’s playroom along with retail and food and beverage (F&B) outlets on the ground floor. The residential tower will consist of 574 apartments, including 12 penthouses featuring plunge pools. 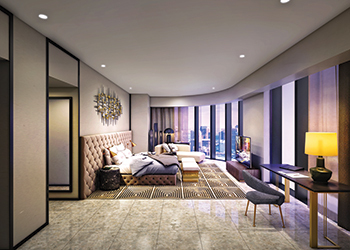 Residences will incorporate innovative technology and feature noble materials and exquisite detailing including metal inserts, carved marbles, and hand blown glass. Wilson Associates has also created stunning architectural interiors for a number of other luxury hotels and resorts coming up in the Middle East, including two key UAE projects – the Anantara Mina Al Arab Ras Al Khaimah Resort in Ras Al Khaimah, and the Vivanta by Taj, Jumeirah Lakes Towers in Dubai, both of which are due to open next year. The Anantara Mina Al Arab Ras Al Khaimah Resort is a luxury eco-themed waterfront property while The Vivanta by Taj, Jumeirah Lakes Towers aims to be a haven of modern elegance.